You cannot say we weren’t warned. On Monday, in the Rangers’ final exhibition of the spring, Elvis Andrus debuted a new walk-up song. A familiar song, you might say. One that your child has probably played on Youtube so many times that you wished you could throw it (the computer; your child) through a wall. One that has wormed its way into the deepest crevasses of your brain, forcing out less memetic information, like the faces of your loved ones. In few places were you safe from the song, but a baseball stadium was one of them. No longer. Yes, “Baby Shark,” the insanely catchy kids’ song that has mutated from a very old nursery rhyme to a world-conquering chart-topper, has hit baseball. We have Andrus to blame or to thank for this, but he’s just doing it for his son. Andrus explained that it’s the favorite song of 20-month-old Elvis Jr., and if you’re not trying to make your kid happy, what are you doing? If you do not want to hear “Baby Shark” coming out of your TV roughly 1,000 times in the next six months, your best bet is to hope for slumps. Creatures of superstition, baseball players will change everything up when they’re struggling, including their walk-up songs. 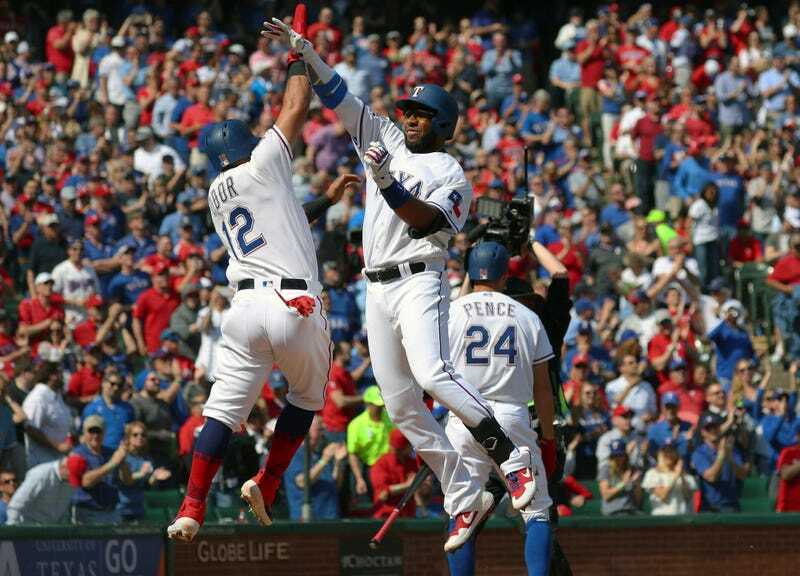 But Andrus went 3-for-4 with a dinger and two RBIs. Dear god. It’s not just Andrus, as it turns out. Cincinnati’s Jose Iglesias also used “Baby Shark” as his walk-up music on opening day. Iglesias went 2-for-3. Dear god. There’s a decent chance that you, gentle reader, are currently saying to yourself, I don’t like it. I hope it goes away.